But I would love to talk about what happened to BitCoin since I lasted "predicted" if you like, that it was heading towards 6000 (around that area). Today we see that its just 500 points above that level. We can say that its hit the predicted target. The Question now is whether its going to drop further? The Answer is Simple. YES it is possible. How did we predict the price so easily and accurately in the first place? 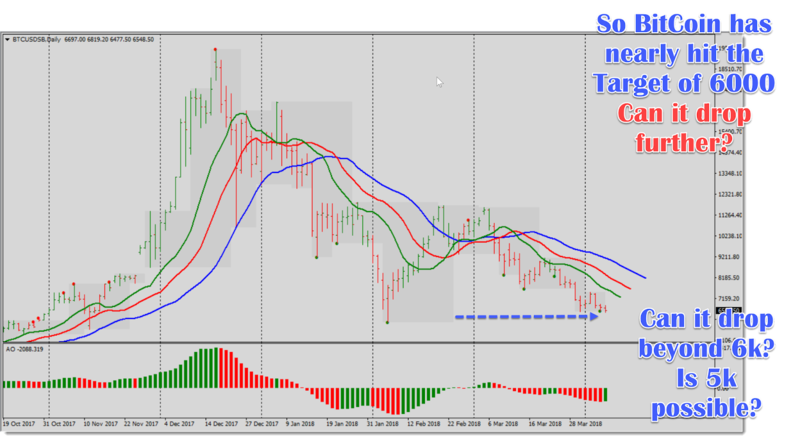 Well, simply using AIMS The Setup Strategy and its core principles. If now we look at where is Target Zone 1 (AIMS the Setup Strategy terminology), we can then see that it is possible it may drop to 5K or even below. I hope you were not heavily invested during this period. It can surely bounce back up but we will talk about that when the market tells us that. And here is the Current Chart where its almost hit the 6K target.